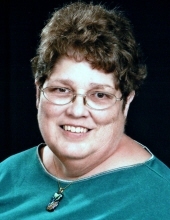 Dorothy L. Pinkus, 65, of Kankakee, IL, died on Saturday, April 6, 2019, at the Momence Meadows Nursing Home in Momence, IL. She was born on June 25, 1953, in Pontiac, IL, the daughter of Laverne and Dorothy Thomas Anderson. She married Robert Pinkus on July 3, 1980, in Kankakee, IL. He preceded her in death on June 10, 1998. She is survived by two daughters and son-in-law; Michelle (Joshua) Dhom of Momence, IL, and Jodi Pinkus of Kankakee, IL. Two sisters and brothers-in-law; Diane (Glen) Little of Kankakee, IL, and Bonnie (Vince) Koenig of Arcadia, FL. Two grandsons; Kodi and Beau Dhom of Momence, IL. She is preceded in death by her parents, and step-mother; Eldora Anderson. She attended Broadway Beauty School and was a hairdresser at the Looking Glass and Ann Oasis in Bradley, IL. She was a member of the Asbury United Methodist Church in Kankakee, IL. She enjoyed crafting, sewing, gardening and loved her animals very much. To send flowers or a remembrance gift to the family of Dorothy L. Pinkus, please visit our Tribute Store. Rev. Scott Henley will officiate. "Email Address" would like to share the life celebration of Dorothy L. Pinkus. Click on the "link" to go to share a favorite memory or leave a condolence message for the family.